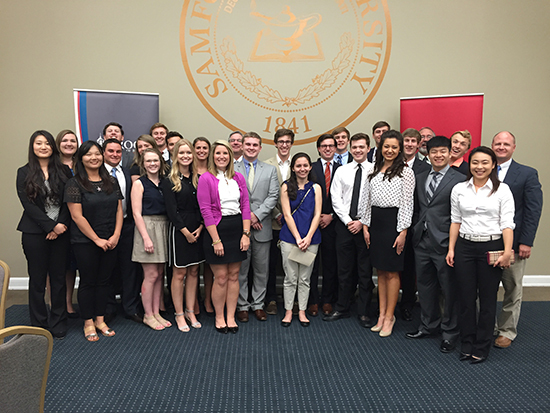 Samford University’s Brock School of Business Financial Management Association (FMA) student chapter has been named a 2015 Superior Chapter. This designation is the highest honor an FMA chapter can receive, and the Samford FMA chapter is one of 22 to receive the award in 2015. FMA has more than 200 student chapters and fewer than 10 percent receive the Superior Chapter designation. The Samford FMA chapter received the Superior Chapter award for membership growth and conducting an active series of events, including a financial services career night, attending the FMA Finance Leaders Conference in New York City, participating in a “meet the firms” road show in Birmingham and hosting numerous professional development speakers on campus. The Samford FMA chapter also recognized Samford alumnus Zach Turnage of Harbert Management Corp. as the 2015 FMA Outstanding Financial Executive for his service to the Brock School of Business. Turnage, a 1998 graduate, is director of investments for Harbert.